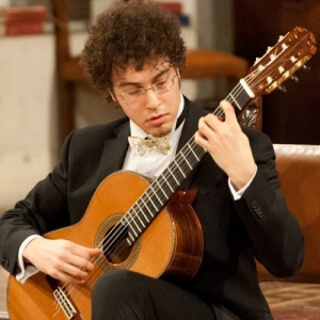 Sponsored by D'Addario & Co.
Browse all lessons from Andrea De Vitis. Use the search bar to filter the lessons by composer, title, difficulty, etc. 1. Open and complete the feedback request form below.2. Attach a video of yourself playing the piece or technique you would like feedback on. Include any questions you may have for Andrea De Vitisin the video or comment section of the form.3. Within 3-5 business days Andrea De Vitis will send you a video response giving you feedback on your playing and answering any questions you may have asked.Most students book private feedback sessions to help them prepare for an upcoming performance or competition, to give them an extra boost on a piece they've been practicing for a while, or simply to receive a personalized interaction with a legendary tonebase artist.The price of private feedback sessions vary depending on the artist — submit a request and we will reply within 24 hours with the artist's rate. All tonebase Premium members receive a 20% discount on every feedback session.